Happy Valentine's Day, everyone! I hope you are sharing it with someone special or some people you love very much. On Valentine's Day when I was single, I would get together with my girlfriends to eat chocolate and watch movies and celebrate our friendship. Now I have a handsome, loving boyfriend to shower with affection for this love holiday. I told him I wanted to take care of Valentine's Day this year, so I have something special planned tonight. Nothing too major, but a fun way to celebrate a silly little holiday. Speaking of love, I got a surprise last week. 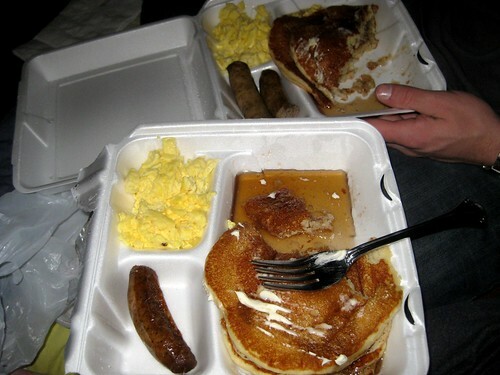 Michael brought me breakfast in bed. This is a difficult thing to do when you don't live together. He had to wake up at 5:30 to go to a local diner to buy buttermilk pancakes, then drive 30 minutes to my house and still make it to work by 8:00. I was so surprised when he showed up at my front door at 6:30 am. I had no time to brush my teeth or fix my hair or put a bra on. But he loves me any way. Me: "Hey honey, what are you up to tonight?" Michael: "I think I might work late tonight to finish up some things." Me: "Oh..." (long silence) "I figured you would want to see me tonight since I will be gone all weekend." Michael: "Of course I want to see you! I just have to get some stuff done at work. I will come over after that." Me: "No, that's okay. I don't want a pity visit." Michael: "What are you talking about?" Me: "It wasn't your idea to come see me, so that must mean that you don't really want to!" Michael: "Sometimes you are very confusing." He did work late on Thursday night and I spent my night nursing a terrible headache and packing for New York. But then on Friday morning, I got my breakfast surprise. I am sorry that I am a complicated, emotional woman sometimes, Michael. But when you bring me buttermilk pancakes and snuggle with me before work, it makes everything better. It really does. 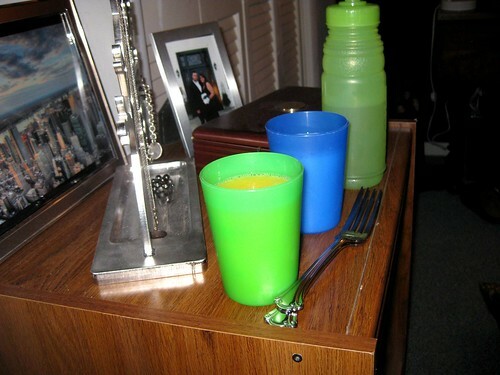 Orange juice doesn't really see it's way to my nightstand very much. I hope you all have a wonderful Valentine's Day, however you decide to spend it! So glad to hear it!...And thanks for the comment on my blog! I just started it so I'm trying to figure out how to get more people to find out about it, hehe. What a sweetheart you've got there. Don't worry too much about being emotional. They get used to it eventually! How sweet! Honey, we're all complicated sometimes! I hear myself saying things sometimes that I don't even understand...but I stick to my guns! :) I usually have to apologize later...I just don't know what comes over me sometimes!